New York Times bestselling authors Karen White, Beatriz Williams, and Lauren Willig present a masterful collaboration-a rich, multigenerational novel of love and loss that spans half a century.... 1945: When the critically wounded Captain Cooper Ravenal is brought to a private hospital on Manhattan's Upper East Side, young Dr. Kate Schuyler is drawn into a complex mystery that connects three generations of women in her family to a single extraordinary room in a Gilded Age mansion. Who is the woman in Captain Ravenel's portrait miniature who looks so much like Kate? And why is she wearing the ruby pendant handed down to Kate by her mother? In their pursuit of answers, they find themselves drawn into the turbulent stories of Gilded Age Olive Van Alen, driven from riches to rags, who hired out as a servant in the very house her father designed, and Jazz Age Lucy Young, who came from Brooklyn to Manhattan in pursuit of the father she had never known. But are Kate and Cooper ready for the secrets that will be revealed in the Forgotten Room? 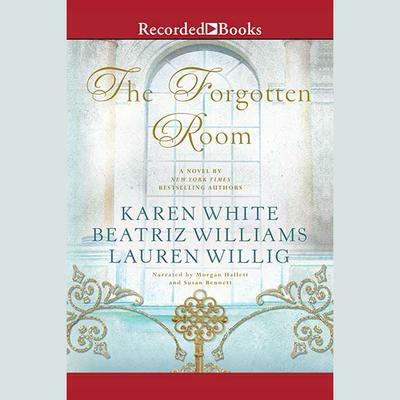 The Forgotten Room, set in alternating time periods, is a sumptuous feast of a novel brought to vivid life by three brilliant storytellers.